The Bank of America® Platinum Visa® Business Credit Card is a no-frills business credit card with no annual fee and a solid sign-up bonus. Though you won’t find it on our list of the best small business credit cards or our roundup of the best low APR interest credit cards, this card has some attractive features. In addition to the $300 statement credit as a sign-up bonus, it boasts a 0% APR introductory promotion on purchases for 7 billing cycles from the day you open your account. For well-qualified applicants, it also holds the promise of a regular APR several points lower than most business credit cards. Alas, the Platinum Visa® Business Credit Card isn’t perfect. It lacks an ongoing rewards program, meaning there’s no way to earn a return on your spending once the sign-up bonus period ends. And beyond a basic cash flow management system and some common Visa®-backed benefits, it offers no deal-sweetening perks. Still, the Platinum Visa® Business Credit Card offers a great opportunity to finance large purchases without incurring interest charges and grab some extra cash with relatively little effort. Here’s what you need to know about its features, advantages, disadvantages, and overall suitability. You get $300 statement credit as a bonus when you spend at least $3,000 within the first 90 days of card membership. The bonus comes as a statement credit to your account. It’s a great way to reduce your business expenses and save money on a tight budget. The Platinum Visa® Business Credit Card has a 7-billing cycle 0% APR introductory promotion on purchases. However, there is no comparable promotion for balance transfers. After the introductory period ends, the purchase APR ranges from 11.49% to 22.49%, depending on your personal creditworthiness and prevailing rates. The balance transfer APR falls within the same range from day one. The Platinum Visa® Business Credit Card has no annual fee or fees for additional employee cards. Balance transfers and cash advances both cost the greater of $10 or 4% of the transaction amount. Late payments cost up to $49. Returned payments cost $39. International transactions cost 3% of the transaction amount. Like all Bank of America® business credit cards, the Platinum Visa® Business Credit Card has an opt-in overdraft protection transfer program (Overdraft Cash Advance) for Bank of America® deposit account holders who wish to protect their checking accounts from overdraft fees. When you opt into the transfer program and attempt a checking account transaction that would normally result in an overdraft, a cash advance is automatically drawn on your credit line. The transaction then goes through as intended. All overdraft cash advances are drawn in increments of $100 – so a $150 overdraft incurs a $200 transfer – and accrue interest at the regular cash advance rate. Each transfer costs $10 or 3%, whichever is greater. This card comes with some useful cash flow management tools for business, including an automatic online payment system, QuickBooks integration, and transaction categorization/tracking through the online MyReport system. The Platinum Visa® Business Credit Card has a decent lineup of basic benefits for travelers, including emergency ticket replacement, travel accident insurance, lost luggage replacement, and complimentary loss and damage coverage for rental cars paid in full with the card. The Platinum Visa® Business Credit Card is meant for business owners with excellent credit. No Annual Fee. The Platinum Visa® Business Credit Card does not have an annual fee. Given the lack of rewards (after the sign-up bonus period ends), this is a crucial benefit for frugal business owners. 7-Billing Cycle 0% APR Introductory Purchase Promotion. This card has a 7-billing cycle 0% APR introductory purchase promotion. That’s long enough to finance relatively large purchases, such as new equipment, a batch of raw materials, or a trip to an important business convention. Alternatively, it’s a nice way to catch a break from interest charges on everyday expenses for a few billing cycles. Generous, Easy to Attain Sign-Up Bonus. For a credit card with no annual fee, the Platinum Visa® Business Credit Card’s $300 sign-up bonus statement credit is generous. And it only requires $3,000 in spending within 90 days of account opening. That shouldn’t be a heavy lift for most business owners. No Penalty APR. Unlike many Bank of America® consumer credit cards, the Platinum Visa® Business Credit Card does not charge penalty interest. If you occasionally miss statement due dates because of unpredictable cash flow issues or unexpected obligations, this can save you dozens or hundreds of dollars each year. Many other cards charge penalty interest indefinitely after the first missed statement due date. Potential for a Low Ongoing APR. This card’s regular purchase and balance transfer APR falls within a pretty broad range. If you have excellent credit, you’ll likely qualify for a rate at or near the minimum, which is a much better rate than most competing business credit cards. For business owners who carry balances from billing cycle to billing cycle, or at least want the flexibility to do so, this is a key consideration. Overdraft Protection for BoA Deposit Account Holders. Clients with Bank of America® business checking accounts can opt into the Platinum Visa® Business Credit Card’s overdraft protection program. This is a great way to reduce (or entirely eliminate) worries about overdrafts, which can result in embarrassing and potentially credibility-sapping problems with clients and vendors. The $10 (or 3%) fee per transfer may be well worth the peace of mind. No Ongoing Rewards. Once the sign-up bonus window has passed, the Platinum Visa® Business Credit Card doesn’t earn rewards on an ongoing basis. This is a big downside relative to other no-annual-fee Bank of America® business credit cards, such as the Business Advantage Cash Rewards credit card. Other issuers offer cash back business cards too, though some have annual fees: Capital One Spark Cash for Business has an annual fee, but earns unlimited 2% cash back on all purchases. For additional cash back ideas, check out our best cash back credit cards list. Has a 3% International Transaction Fee. 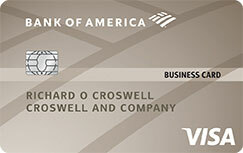 The Platinum Visa® Business Credit Card from Bank of America® has a 3% international transaction fee. That’s bad news for cardholders who routinely travel outside the United States on business. The problem is exacerbated by the fact that this card has no rewards program. The optimal solution: a no-international-transaction-fee business credit card with a generous rewards program. Chase Ink Business Preferred Credit Card fits the bill perfectly. No Introductory APR Promotion for Balance Transfers. The Platinum Visa® Business Credit Card lacks a 0% APR introductory balance transfer promotion. If you’re facing high-interest credit card balances elsewhere, you’ll need to find another credit card to transfer and pay them down. Even if you don’t consider yourself a small business owner, you could qualify for this credit card. Many people don’t know that independent professionals and freelancers can qualify as business owners in the eyes of the law. Though every credit card company is different, most issuers allow you to open a business credit card account if you pay self-employment tax (typically using Schedule C or Schedule C-EZ) and affirm that you will only use your card to finance business purchases. Before you assume that you’re not eligible for the Bank of America® Platinum Visa® Business Credit Card (or any other small business credit card), take a closer look at your situation. You might be surprised by what you find. The Bank of America® Platinum Visa® Business Credit Card is a no-frills product that’s great for business owners looking to catch a break on interest charges or capture an easy $300 by spending at least $3,000 within 90 days of account opening. Plus, with no annual fee, there’s no financial downside to keeping it around for occasional use (provided you pay off your balance in full each month). However, as Platinum Visa® Business doesn’t have an ongoing rewards program or perks to interest more discerning clients, many new cardholders will likely set it aside once the sign-up bonus and 0% APR introductory periods pass. Key benefits include the lack of an annual fee, the 7-billing cycle 0% APR introductory promotion for purchases, the $300 statement credit sign-up bonus, the potential for a low ongoing interest rate, the nonexistent penalty APR, and the overdraft protection transfer plan for Bank of America® deposit account clients. Major drawbacks include the lack of rewards, the 3% international transaction fee, and the lack of an introductory promotion for balance transfers. Overall, this is a great card to hold temporarily while you capture the sign-up bonus or finance a large, interest-free purchase.